Participants in seminar on media, women and youth in Alexandria, Egypt. IPJ Director Magda Abu-Fadil speaks on Lebanese media, women and youth. Experts from various Arab countries share knowledge and experiences. 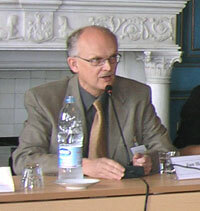 Jan A. Henningsson, director of the Swedish Institute in Alexandria, welcomes participants to seminar. 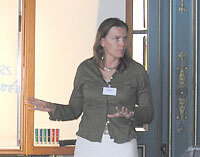 Kristin Olson, program officer, division of culture and media, Swedish International Development Cooperation Agency highlights media-related organizations. Experts and students from the Middle East/North Africa region met to discuss the role of media, women and youth in a seminar organized by the Olof Palme International Center that will set the tone for a wide-ranging development scheme. Institute for Professional Journalists director Magda Abu-Fadil spoke (PDF) at the event February 20–22, 2005 that grouped participants from Algeria, Egypt, Jordan, Lebanon, Morocco, Tunisia, Syria and Palestine at the Swedish Institute in the Egyptian port city of Alexandria. The seminar/workshop entitled “Media, Women and Youth in the Middle East and North Africa” was organized by the Palmecenter and the Swedish International Development Cooperation Agency in a bid to launch a long term regional media development program. The Palmecenter was commissioned by SIDA to come up with a program framework for freedom of expression in support of democracy and enhanced respect for human rights in the region. The seminar/workshop attracted some 25 women and young people who initially focused on media and media development from a gender and youth perspective. It primarily set the stage for cooperation and partnerships and provided participants with an opportunity to engage in a regional exchange and extensive networking. Participants were invited because of their experience or interest in the fields of print, broadcast and online media.